Erin took us out to walk off the hangover the morning after the dive. 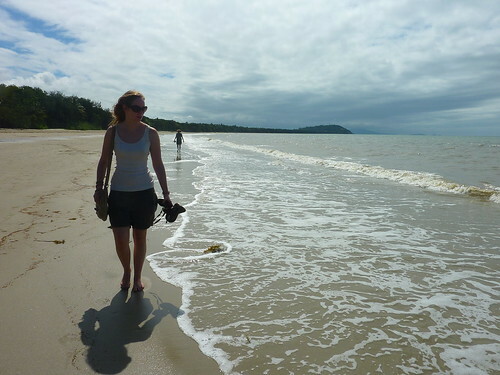 Port Douglas beach is only about 10 minutes walk away from their place. I should really mention Tom and Erin's house - it's lovely. 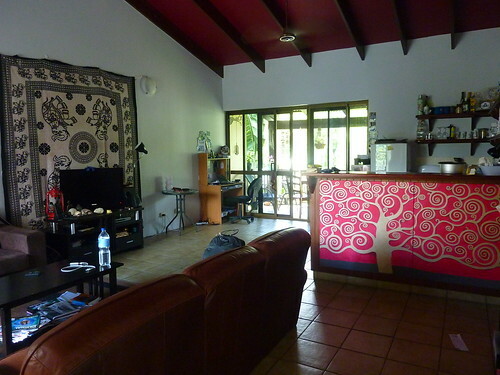 In fact, the houses in Australia in general are better laid-out, and have a lot more character than those in the UK. This is probably due to having far more space in the country than we do, where anything with "character" is likely to set you back half a million. They are only renting at present but an apartment which is almost identical came on the market just as we left, and they were going to bid on it - I don't blame them. Did I mention that they had a communal pool in the backyard? 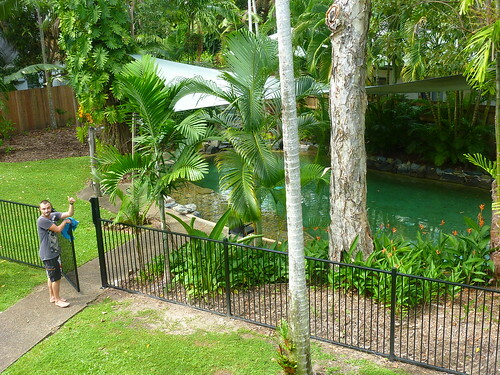 Time was ticking on, so after a great lunch put together by Erin we set off for the Daintree. 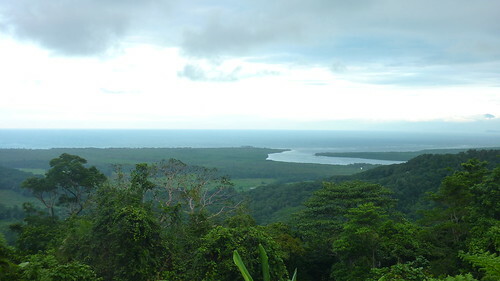 This is a rainforest in the north of the east coast which covers a vast area; we were heading to Cape Tribulation, a reputedly beautiful area on the coast's pinnacle. It's a little out of the way and you have to take a car ferry to get to it. Cape Tribulation Camping was our destination for the evening, and the road to get there was spectacular; we stopped a couple of times to take in the view. 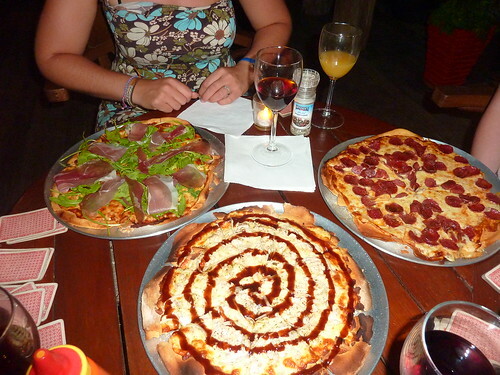 After arriving at the campsite, the four of us were starving so decided to combat this with pizza. It was a good strategy. We were able to see a bit more of the area we were staying in the following day. It was stunning, set on edge of the forest with a beach on the doorstep. 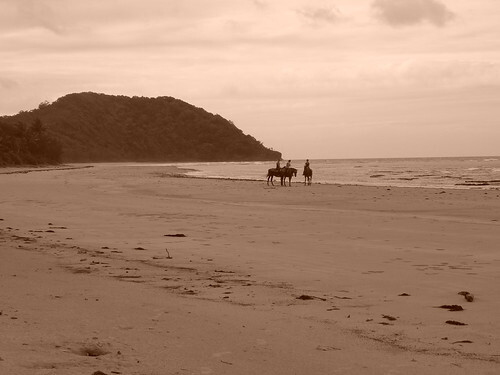 There are a number of walks you can do in Cape Tribulation, the easiest of which are along the many boardwalks accessible from the beach. We decided to go on the Dubuji Boardwalk, which was a one hour round trip. 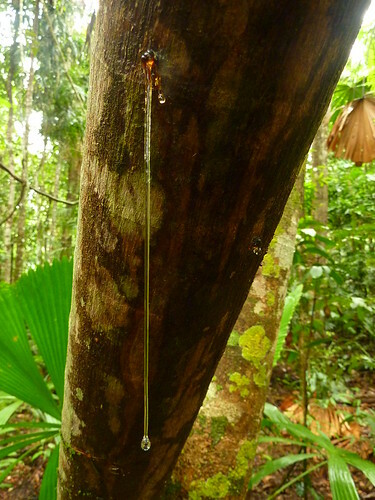 Pleasant enough, but there wasn't much to see other than rainforest and sap dripping from trees on the route. A few people behind us on the walk said that they saw a cassowary on the path; we tracked back but couldn't see it. It must have vanished into the bush. 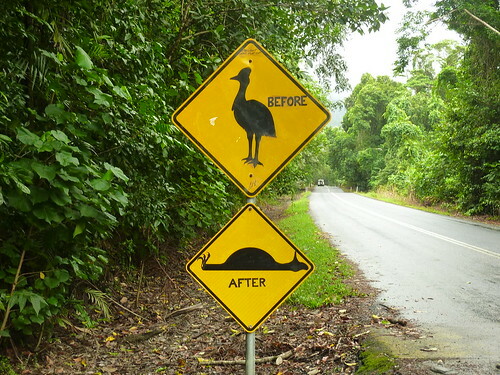 Cassowaries are flightless birds which are rare in the wild now; less than 1500 can be found and so there are plenty of warning signs around warning people to watch out for them when driving. 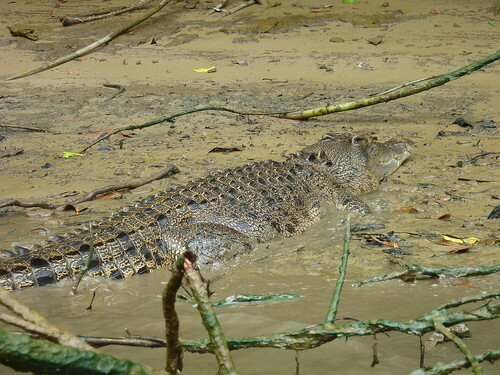 Paul and Fi left the next morning whilst we hung around to go on an eco-tour up the river to see some crocodiles. 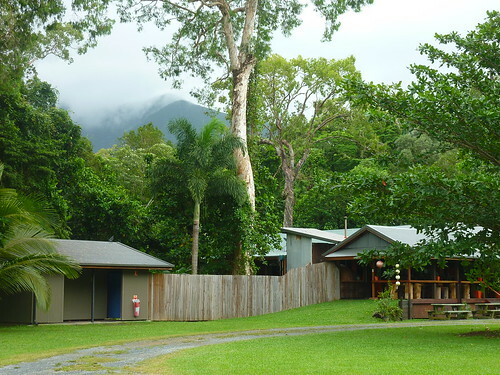 First of all though, we stopped at the Daintree Ice Cream Company for some locally produced ice cream. Four flavours in one bowl - soursop, passionfruit, black sapote (which tasted like chocolate) and wattleseed. It wasn't bad, but had obviously been frozen previously and tasted a bit icy which was a shame. 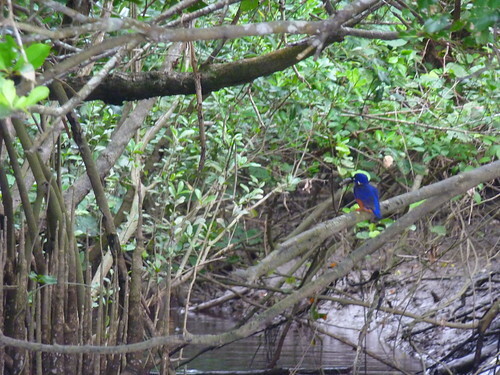 Still, it kept us going until the Daintree River Wildlife Cruise started. We got on an electric boat called the Solar Whisper which glided up the river making next to no noise at all, whilst our guide provided a heap of information about the river's occupants. 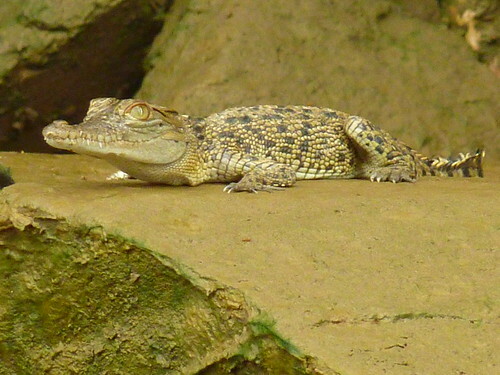 Freshwater crocs are more placid than their saltwater counterparts. Interestingly, the saltwater variety can be found in either fresh or salt water, which makes things interesting. I guess keeping your distance is probably the best advice all around. 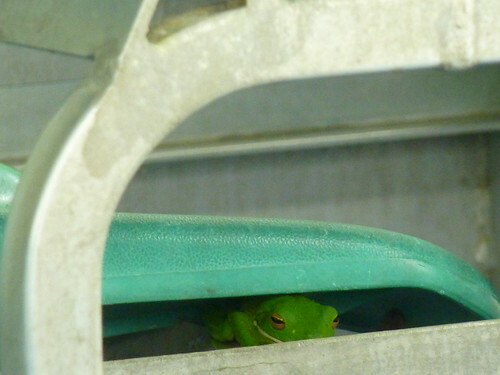 Funnily enough, the first thing we saw wasn't a crocodile, but a frog which was taking refuge in one of the boats by the pier. 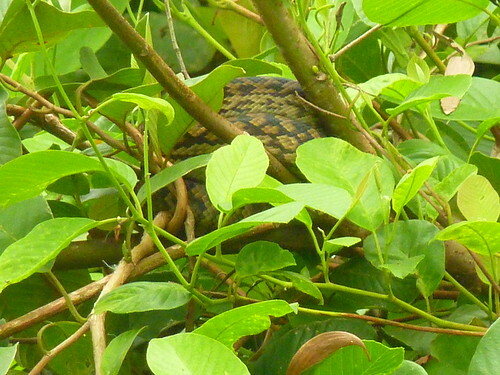 The guide then spotted an amethystine python in a tree nearby. These can grow up to 8.5m long. 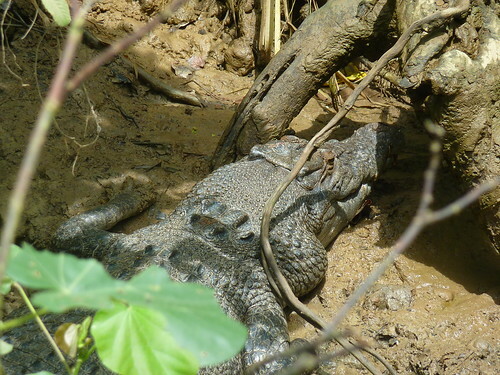 It wasn't long before we saw our first croc. It was only a baby, about 2.5 months old. The dominant male in the area is called Scarface who is around 4.5m long. We didn't see him in the area; males don't tend to have much to do with rearing the kids. Even the mothers don't hang around for long, as the babies only stay around for a couple of months before they are expected to look after themselves. 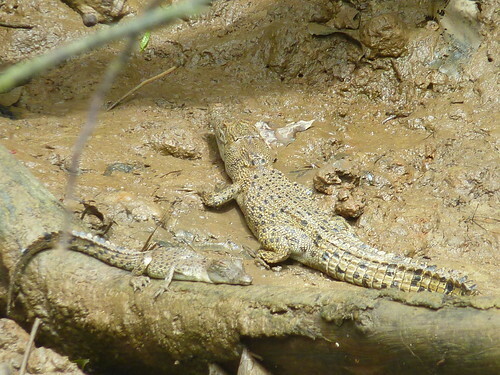 80% of the crocs in the river are female. Gender is determined by very specific temperatures in the nest: if it's 31.5 degrees Celsius, the egg will hatch as a male. Any hotter or colder, and the baby will be female. Less than 1% of eggs will survive. 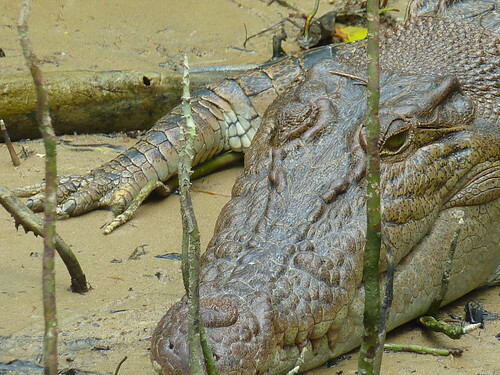 They're eaten by birds, wild pigs, iguanas, sharks, and other crocodiles. If they survive that, they may well be flooded out (that's assuming they are even fertilised to start with). Once they get to six years old they can start to relax a bit, as they'll have grown to about 1.5m long at that point. We met Dusty along the way, a female aged somewhere between 30 and 40 years. She was huge. Elizabeth was around 20 years old, and had a few of her babies still hanging around her. 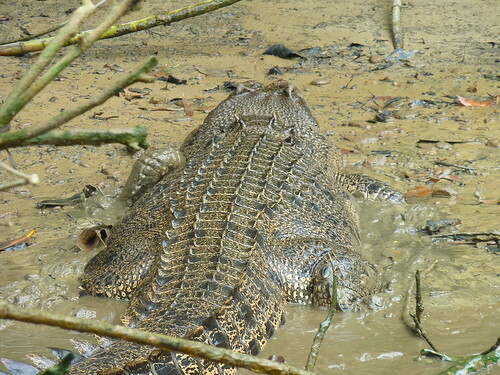 It was a decent trip out, lasting about an hour and a half and I think our "crocs in the wild" quota was well and truly filled. After lunch we drove back down the coast, in the direction of Townsville where we were planning to meet up with Paul and Fi. We didn't make it that far as it was quite a trek. Instead, we stopped overnight at Bushy Parker Park on a free site and cooked up a decent chicken curry on the portable stove. It wasn't far to Townsville so we could get there early the next morning to begin the celebrations for Fi's birthday!